Three kids trapped upstairs!! WHAT WOULD YOU DO?? Have discussion/debate on what you would do. Then click on VIDEO BELOW AND REVIEW!! First line to the fire, second protect the stairs. Ves through second floor window, make sure to close the bedroom door soon as you enter. First off (acting as if I don’t already know what happened here) I would aggressively stretch a handline to the 2nd story-knocking down the fire and searching- while simultaneously sending(in our dept. we typically have 5-6 FF on scene on initial) the 2 man Rescue crew to VES upper adjacent windows or rooms where occupants stated people were trapped. 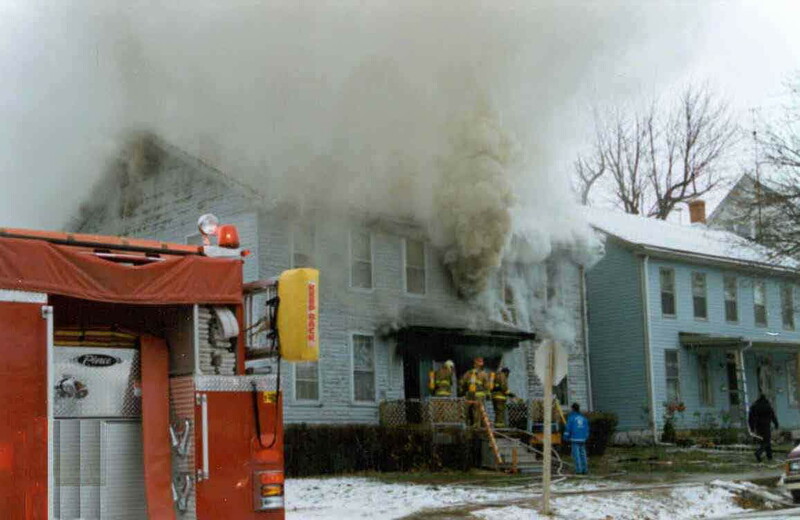 I would probably falsely assume it’s a easy upper story room fire…no worries…until you watch the video doc on this one! This so vividly illustrates why a 360 degree size up is so important. From the street side you would think, room and contents on second floor. However, upon seeing the pics from the rear of the house (found in NIOSH report) it gives a much clearer picture. Limited manpower (only 3 initial FF) had a major effect on the turn out of this fire. From what I could gather they were faced with a choice to go for the save or take the time to get a line in operation and put a knockdown on the fire first. They chose what I feel most of us would choose, and unfortunately it cost them everything. So many variables play into how you could handle this. But if faced with the same scenario with the same number of initial personnel, I think of two possible ways to tackle this. First, my initial thoughts were VES of the upper bedrooms via ground ladders. The D/o could throw additional ladder(s) for egress while the Lt and FF conduct rapid searches of each upper room. Of courese, it would have to be clearly communicated to leave the front door CLOSED so as not to draw the fire more quickly to the stairs. The Second possibility that went through my head was to have the D/o sit just inside the front door with a charged line to protect the stairwell while the other two personnel made the rescues. Although I would communicate to the Chief and other FF arriving on scene to immediately begin throwing ladders for secondary egress. This line at the stairwell could possibly slow the fire progress long enough to affect the rescues more safely. Just wish the outcome would have been different for these brothers. True B, whoever is in the bedroom of origin is done for anyhow…Anything to stop the “process” of fire advancement!